The diversity of Twin Cities jazz, on any given week, is a marvel. Just within a couple days you can hear it all, from free improvisation to ballroom foxtrot. Throw in some savvy swing, sizzling bebop and a preview of local jazz yet to come…. 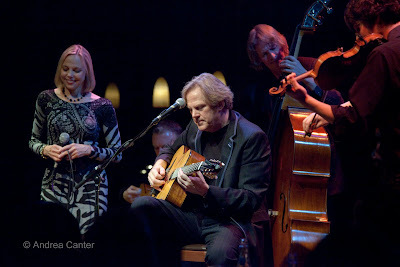 John Jorgenson Quintet with Connie Evingson at the Dakota, November 11. Connie’s appearance with swinging guitarist/clarinetist John Jorgenson was added rather last minute, but her association with him has been growing, with a recent concert at the Hopkins Center for the Arts and a recording date this past week. I missed John’s bouzouki in the first set, but his guitar and clarinet were on fire later in the evening on some hot club standards; his violinist Jason Anick would have made Grappelli smile, and Connie was in full swing mode, every note where it belonged. Get me in line for that new CD. Insurgent at Studio Z, November 12. The usually conservative offerings of the Twin Cities Jazz Society’s “Jazz From J to Z” expand at least once per year beyond post-bop. And there is no finer group traveling “beyond” than the trio Insurgent, with pianist Ellen Lease, alto saxophonist Pat Moriarty and drummer Phil Hey. Pat and Phil have a long history of free jazz conversations, and adding an inventive pianist like Ellen ups the options for melody and harmony, both prevalent despite the usual connotations of “free jazz.” This is mayhem you can almost sing, even while Ellen reaches “under the hood” with little mallets, even while Pat blows whispers or honks of dead air into his mouthpiece, even while Phil scrapes the edge of a cymbal like fingernails on a blackboard. Saturday night, they gave us two sets of curiously sustainable sounds, new messages that seemed intended as much for us in the audience as for each other. This free jazz was not free of meaning. 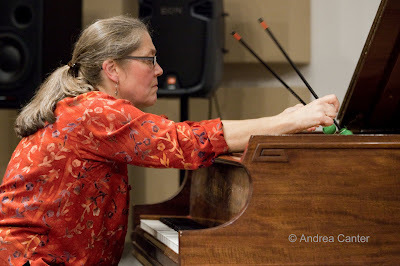 Sue Orfield and the Tuesday Night Band at the Artists Quarter, November 12. Until she brought her steamy quartet to the Twin Cities Jazz Festival last June, it had been a good five years since I heard tenor saxophonist Sue Orfield. She plays in the environs of Eau Claire and rarely gigs in the metro area. Hopefully that is about to change. A strong guest soloist can bring out the best in an already-topnotch band, and perhaps that has never been more obvious than Sue’s gig with the Tuesday Night Band (B-3 monster “Downtown” Bill Brown, guitarist Billy Franze, drummer Kenny Horst) this past weekend. I caught the second set Saturday night (after Insurgent) and found new meaning in the phrase “blown away.” There’s Sue herself, blowing fast and hard and soulfully on Charlie Parker’s “Segment” and “Mr. PC,” with sweet passion on “In a Sentimental Mood,” and wailing from deep in the swamp on an interesting take on “Ode to Billie Jo.” But even more uplifting was the interaction among the four musicians, summed with gusto on the closing “Sister Sadie” and evident in every grin on and off stage. From the crowd to the musicians themselves, no one doubts this combination should percolate for years to come. PipJazz Sunday’s Student Night at Landmark Center, November 13. It’s no easy feat to produce a concert-length jazz program every month. Chicago’s best kept secret is now ours, ever since vocalist Pippi Ardennia moved here two years ago. With drummer/producer Glenn Swanson, Pippi has directed a monthly family-oriented jazz concert in the Weyerhauser Auditorium of Landmark Center, featuring a first-class guest artist along with a dream house band and Pippi herself. Now Pippi and Glenn have enlisted support from the Twin Cities Jazz Society and Walker West Music Academy to identify area student musicians to join the monthly program. This Sunday was the student kickoff and the concert featured three outstanding young artists from 13 – 17, each playing with the house band on a selected tune, and then returning for more interactive excitement. 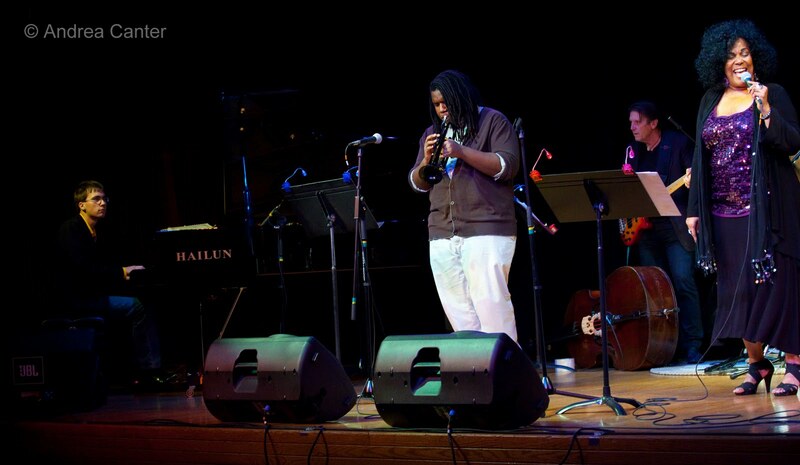 Eighth grader Jordan Anderson made his big stage debut with Lee Morgan’s “Ceora,” followed by 16-year old trumpeter DeCarlo Jackson killing on “Billie’s Bounce” and 17-year-old UW-Eau Claire student Quentin Tschofen bobbing and weaving through Mingus’ “Peggy’s Blue Skylight.” Not your typical high school band fare. Quentin and DeCarlo teamed up on “My Funny Valentine,” with Pippi providing the impassioned vocals; Jordan switched to electric keyboard for “Ain’t No Sunshine,” and everyone had a run at “All of Me.” Seriously good young artists often find public performance opportunities with their own ensembles or school bands; sharing the stage and the musical exchange with seasoned pros is a rare learning experience. Watch for the PipJazz closing 2011 concert December 4th with high school violinist Zosha Warpeha, and, starting in March, a monthly student guest throughout the 2012 season. 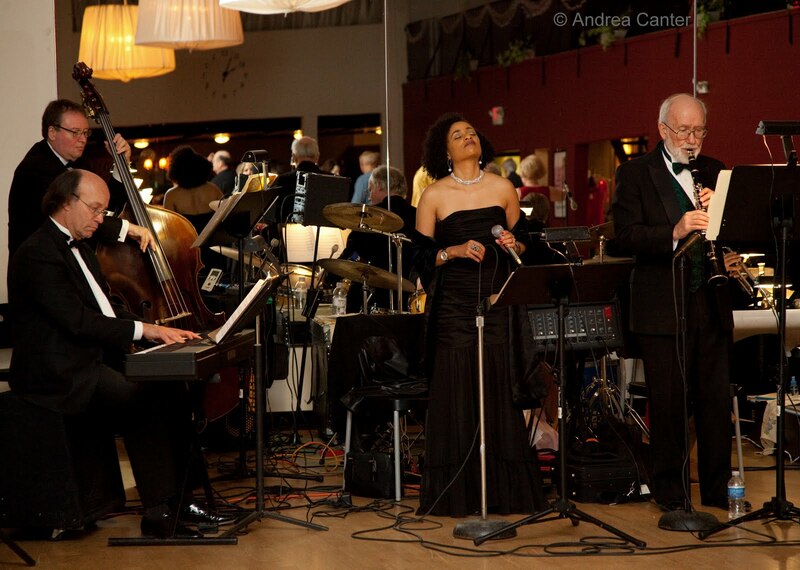 Jerry O’Hagan Orchestra With Charmin Michelle at Cinema Ballroom, November 13. It was a little odd to find myself facing a swing band in a ballroom. Asked to take photos of band for a forthcoming CD, I found myself –two left feet and all—tapping my toes as I moved around the floor dodging a diverse but enthused group of ballroom enthusiasts who gather most Sundays at Cinema Ballroom in St. Paul. I barely remember Arthur Murray’s Dance Party but if the music was this good, it must have been a hit show. O’Hagan himself is a fine clarinetist in the tradition of Benny Goodman and Artie Shaw, and the guys in the 14-piece band are quite accomplished practitioners of swing, bop and Latin stylings, from the swinging pace of “That Old Black Magic” to the south-of the-border sway of “Takes Two to Tango” to the heated instrumental of Jerry’s own “Dante’s Garden.” If you are accustomed to the intimacy of Charmin Michelle at Fireside Pizza or the Dakota, it’s a treat to hear her front a big band, proving you don’t need Ethel Merman pipes to prompt a multi-generational roomful of dancers to take flight. If you’re pining for the good old days of swing bands and dance floors, check the schedule as Jerry and Charmin and company preside nearly every Sunday night. And watch for the upcoming release of Dance Party Volume 1. Graydon Peterson Group at The Nicollet, November 15. It’s good to see this little coffee and music joint thriving. On the corner of Franklin and Nicollet, maybe the vibe of the old Acadia (now on the West Bank) is blessing both the coffee and the music. Tuesday nights, Maryann Sullivan and Rhonda Laurie are booking a diverse range of jazz, often new bands and bands that don’t get much visibility. Yet. One of the metro’s most active and eclectic bassists, Graydon Peterson has seldom been heard in the role of leader, but hopefully that is about to change. With guitarist Vinnie Rose, trumpeter Adam Meckler and drummer Adrian Suarez, this quartet brought new music to The Nicollet in a vein that might have been unexpected by the coffeehouse regulars and swing dancers. But even new music has a beat, and before night’s end, a pair of dancers found their feet adapting to post-bop inventions. A growing number of area musicians drop in on Tuesday nights to check out the scene, giving the Nicollet a downtown, Big Apple, little loft feel. With better coffee. Al Jarreau, Pantages Theater, November 16. He used to come more often, but it has been a while since the master of anything with a human voice returned to his old haunt. Now in his 70s and hobbling a bit, Jarreau was nevertheless in fine form on a "greatest hits" songlist, if sometimes overpowered by the ultra-amplification at Pantages. Things equalized better in the second set when we could much better hear the lyrics and the nuances that have made Al an inspiration to many, including his young bassist Chris Walker who nearly stole the show when given the chance to show off his elastic soul voice. Listening to an aging John Hendricks on the way home, I was struck by the similarities, Jarreau's voice far more supple at this point but the lineage is apparent. And I would love to hear a duet with Bobby McFerrin.